Another fabulous day on the Harbour with the second round of the NB Sailsports Sprint Series sailed from Middle Harbour Amateur Sailing Club on Sunday 4th August. 49 boats competed in the three races held in a pleasant but shifty breeze which kept everyone on their toes. Winners on the day were Blake Seley in the 4.7′s with a 1,1,2 Shane Conly in the Radials with a 3,2,2 and Ryan Palk in the Standards with three bullets. Well done the young team of 4.7 sailors from Woollahra who sailed over to Middle Harbour to compete.You can see the results for the day here and the for series to date here. You can see some photos of the races taken by Geoff Lucas here. Thanks to Middle Harbour Amateur Sailing Club for the event organisation, the catering and arrangements for parking and rigging. 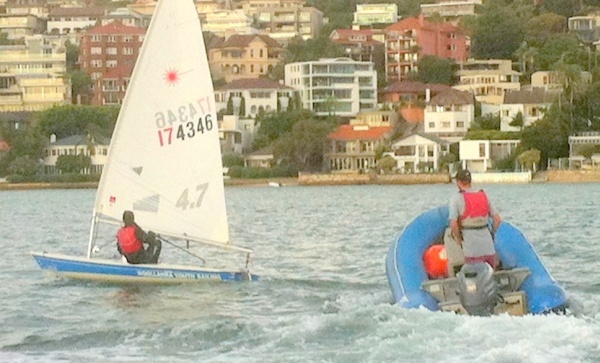 The next leg of the Sailsorts Sprint Series is at Gosford on Sunday 25th August with the first race start at 1.00pm. The latest edition of Laser World is now available here. This edition features an interview with Lijia Xu the current Olympic Women’s Champion. 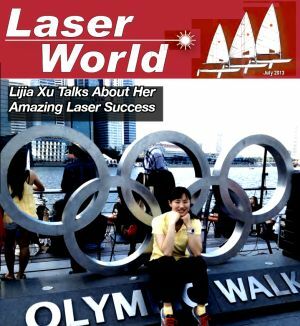 If you want to see a really great Laser race – to see how mentally and physically tough Lijia Xu was to win the Olympic gold medal race at Weymouth have a look at the You Tube video of the race (circa 50 minutes) here. The next round of the NB Sailsports Winter Sprint Series is on at Middle Harbour Amateur Sailing Club on Sunday 4th August. As for each of the four rounds there will be three races. For Middle Harbour the warning signal for the first race will be at 1.00pm. The Notice of Race for the Series is here. The Sailing Instructions for Middle Harbour leg are here. Parking will be limited, so sailors including MHASC members will be encouraged to drop off their boat and gear, and then to park their cars off site. Free parking is available on Parriwi Road, but some distance up the hill. Paid parking is available in the Council Carparks on both sides of Spit Road near the club, or at on-street metres in Parriwi Road. Food and drinks will be available at the Club both before and after the racing. It should be a great day of Laser racing so come along and enjoy it. 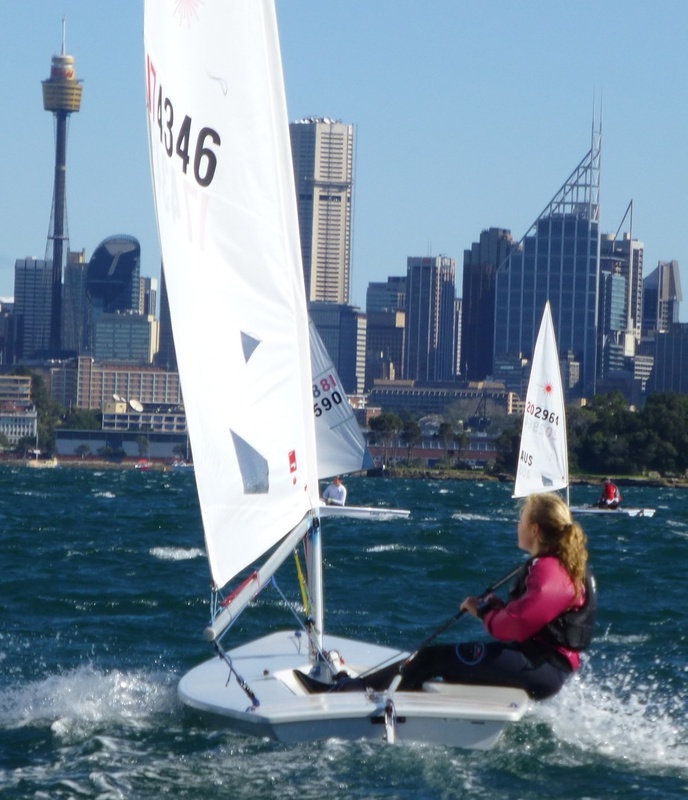 We had 44 entries and lots of breeze from the west to kick off the NB Sailsports Winter Sprint at Woollahra Sailing Club on Sunday. Sean Atherton won each heat in the Standard Rig. Martin White leads the Radials in the series with consistent 2,4,2 results and Hannah Ranger with 2,2,3 leads in the 4.7′s. You can see a report on the racing on the day written by the winner Sean Atherton here. The 4.7 sailors in particular did well in what were, at times, pretty testing conditions. Thanks to Woollahra Sailing Club for hosting these races. Everything ran like clockwork as usual. The results are here and you can see some photos of the action taken by Peter Heywood here. The next race day for the series is at Middle Harbour Amateur Sailing Club on Sunday 4th August with the first race start at 1.00pm. 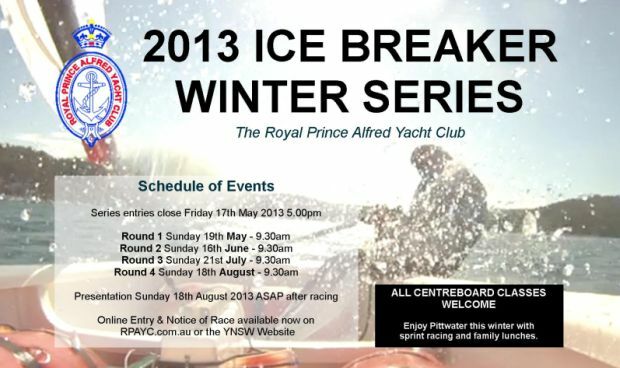 The NBSailSports Sprint Series kicks off 10.00am this Sunday 21st July at Woollahra Sailing Club. NBSailSports have donated a free trade on a brand new Laser as first prize for the series. All entrants earn tickets based on entry and performance. There will be a prize draw held after racing on the final day of the series at Double Bay. 1st Prize: A FREE TRADE on the LASER that you used in the regatta in exchange for a new LASER. Terms: The new boat prize includes the boat, foils, turbo kit and ropes, sail and spars. The trade-in must replicate this making a like for like swap – old boat for new boat. The trade in must be the boat you have used across the regatta series. If you have borrowed a boat other arrangements will be made at the discretion of NB Sailsports. Eligibility: Members of the AST or Australian Sailing Squad or other non-Australian National Team or Olympic representative are NOT eligible for the main prize of the Laser. The Royal Prince Alfred Yacht Club is seeking a highly motivated Assistant Coach to assist the Head Coach with the Club’s extensive yacht racing, youth development, sail training and cruising programs. All Laser sailors are invited to compete in the NB SailSports Winter Sprint Series. 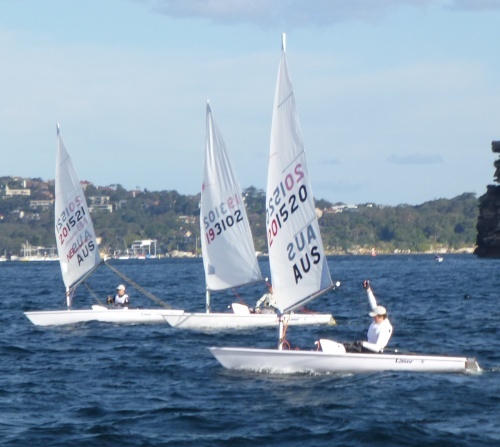 This is a series of short races, 3 per day, held at 4 venues Woollahra Sailing Club, Middle Harbour Amateur Sailing Club, Gosford Sailing Club and Double Bay Sailing Club. This series has been scheduled to coincide with pre-season events already planned at these clubs together with a new one at Middle Harbour. The format is designed to give everyone the opportunity to get some pre-season racing in a variety of conditions at several venues. The earlier starts at some of the venues is an attempt to catch the best of the winter winds. There will be three races each day total 12 with 9 to count towards the series result. This means you can sail in three of the four events and still get a decent score. NB SailSports are the sponsor of the series and will provide some great prizes. As well as providing prizes NB SailSports will have their van at the venues to assist sailors to upgrade their gear. New ropes sails spars and repair kits will be available with Mitch Buckingham able to give advice and provide assistance. They can also arrange bookings for hull touch-ups and repairs and of course take orders for new boats if your old one is not up to scratch. This year Double Bay Sailing Club are running a season kick off regatta on 7th and 8th September. The Regatta will comprise three races each day with the Saturday start at 12.00noon and Sunday 11.00am. Entry which can be placed at the Club is $40 or $20 for sailors under 21. DBSC have an arrangement with Double Bay Public School for trailer and car parking. This arrangement and race details are in the Notice of Race here. You can see the Notice of Race here or contact Sailing Administrator Jenna Walters by phone on 02 9998 3762 or email jennaw@rpayc.com.au. On 23rd April the International Laser Class Association ILCA issued a statement covering the ongoing dispute over Laser licensing. 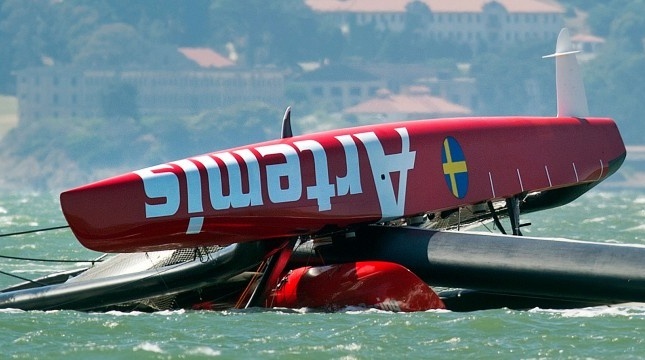 The statement outlines actions taken by ILCA and the International Sailing Federation ISAF to ensure the continued supply of Laser boats and equipment and retention of the Laser as an international and Olympic class. You can see the ILCA statement in full here. Co-incident with the ILCA statement ISAF issued its own complimentary statement which you can see here. 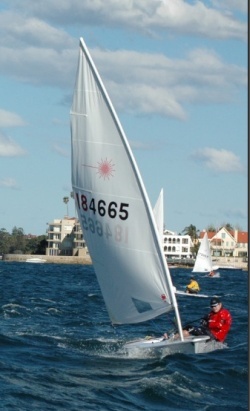 Woollahra Sailing Club has purchased Laser 4.7 rigs for youth sailors for use on club boats or for loan to members who have a Laser in the family. Jakub, the new Club Coach, is leading youth training with an active youth classes after school and weekends to fit youth availability. Youth members are encouraged to join the youth group in the programs. Run a weekday after school coaching and race Sunday program starting in May and running for 8 weeks. Have two school holidays 4 day camps which are now fully booked. Run winter sailing on Sunday at 10.00am starting on 16th June. Run morning (light weather) practice races on Sundays a.m. Contact Woollahra Sailing Club if you are interested.